©London News pictures...27/10/2010. Matthew Phillips aged 5 studies the flower whilst holding his nose. The 'flower' that smells like rotting meat is flowering today in its full smelly bloom. The display could last for two more days - titan arums are usually spent within three days of flowering. This morning, the flower began to unfurl and reveal it's blood-red interior. The pungent aroma has slowly spread around the Princess of Wales Conservatory, described as a mixture of rotting flesh and boiled cabbage. 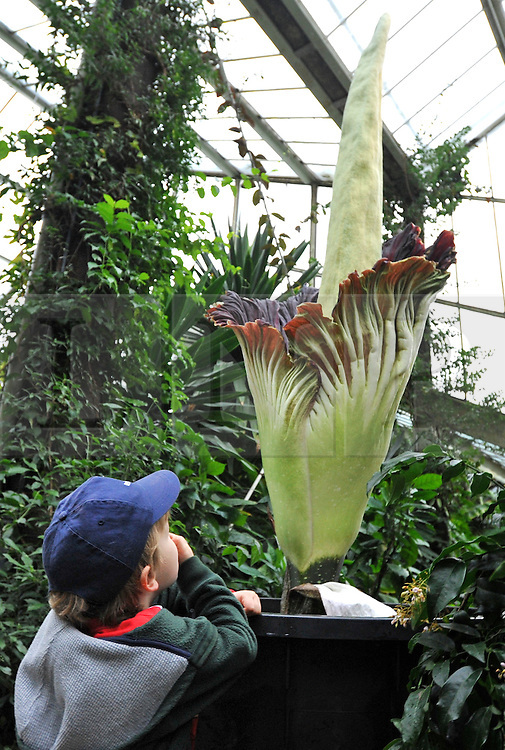 This strong smell has earned titan arum the name of 'corpse flower'. Phil Griffiths, Head of Glasshouses, at Kew Gardens said, "The titan arum is one the most dramatic flowerings in the natural world and is truly remarkable. They usually only last for three days so visitors should get down to the Gardens as soon as they can to see the first of the titan arums in bloom". The titan arum is the world's largest 'flower' and is native to Sumatra where it lives in moist rainforest conditions. In the wild, its enormous red flower and pungent aroma becomes an irresistible invitation to sweat bees and carrion flies.